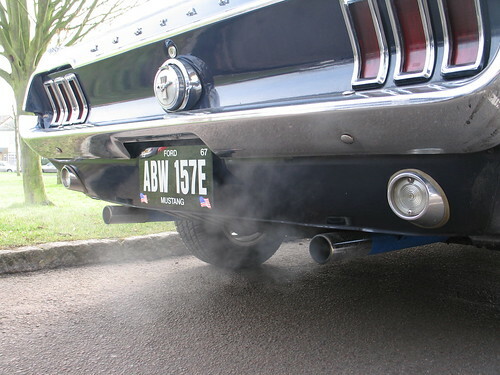 What comes out of your tailpipe is subject to a wide range of descriptions. Image from Flickr. In the world of alternative fuel and low-emissions vehicles, there is a patchwork of regulations across the country. While national regulations on vehicle emissions do exist, some states have more strict standards. This patchwork has created a veritable storm of abbreviations about vehicle emissions. Here’s what the most popular of these abbreviations actually mean. The LEV or NLEV standard was first instituted by California as the “Low Emission Vehicle” standard, and later adopted as the “National Low Emission Vehicle” standard. These standards, for passenger cars, mean emitting less than 3.4 grams per mile of carbon monoxide. This standard is applies through about model year 2003. Ultra Low Emission Vehicle standards, in many states, applies to vehicles in model years 2003 to 2010. These ULEV passenger cars are required to emit no more than 1.7 grams per pile of carbon monoxide. Alternately, ULEV vehicles are required to emit no more than half of the emissions of comparable model-year vehicles. Super Ultra Low Emission Vehicles, otherwise known as SULEV cars, are required to emit no more than 10 percent of the average emissions of comparable model-year vehicles. SULEV vehicles are, most often, ultra-efficient hybrids or alternative-fuel vehicles. The standards for a PZEV — Partial Zero Emission Vehicle — are the same as for an SULEV vehicle. However, to qualify as a PZEV, a vehicle has to have extra controls on gas evaporation and must maintain low emission levels for 150,000 miles. As of 2001, there are several ordinary gasoline engines that qualify as PZEV. Used mostly to refer to hydrogen-fueled or electric cars, Zero Emissions Vehicles are not always necessarily totally “zero emissions.” For example, a car that charges off of the power grid can still be considered ZEV – even though the grid does still put out some pollution. Though some states use alphabet soup to describe the efficiency of vehicles, the federal government and EPA have opted to go with a different system. By 2016, vehicle makers will be required to build cars with an average fuel economy rating of 35.5 miles per gallon. "Used mostly to refer to hydrogen-fueled or electric cars, Zero Emissions Vehicles are not always necessarily totally “zero emissions.” For example, a car that charges off of the power grid can still be considered ZEV – even though the grid does still put out some pollution." The term "patchwork of regulations" is misleading. Under the Clean Air Act, there is a federal set of standards, and also California's stricter set of standards. The choice is 2, and not 50. Keep on sharing more article..